Mobile video optimization isn’t only about making videos play smoothly on smartphones of different screen sizes. Popular video hosting sites can help you to that end. 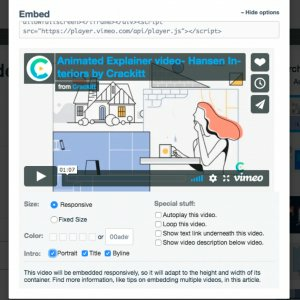 Vimeo and Wistia even offer responsive embedded code so that you can upload videos on your landing pages or blogs without worrying about the container size. Optimizing videos for mobile can be tricky. This article will not just help you fit your videos within the screen of a mobile device, but also help you improve these videos to increase conversions. We have more video optimization hacks laid out for you below. Dig in. And note that making videos playable on mobile is not your end goal. What matters more is conversion. Why are we even paying so much attention to mobile? 1. Mobiles give you a wider reach compared to desktops. 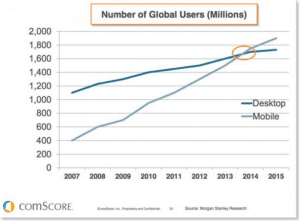 A study indicates that there are more mobile users now than desktop users. 2. By 2021, 75% of all mobile traffic will come from video content. Per these 2 points, you get the idea that mobile browsing is on the rise and people like to watch videos, more on the smartphone than on their desktop. Ergo thinking out a mobile-first strategy is crucial for your video marketing success. After all, it’s much easier to watch a video on your phone. And the cherry? 92% of mobile video consumers share videos with others. That means easy marketing for you—higher views, engagement, and click-throughs! Most videos are designed to play in the landscape orientation. But let’s face it—we hold our phones vertically 94% of the time. So, it can be a hassle to flip your phone just to watch a video and then flip it back. Sounds like a waste of time, right? Many marketers thought so and are now A/B testing their ads with vertical videos. Vertical videos are popping up as in-app ads too. So far, we have heard a lot of success stories about use of vertical videos. Chartboost adopted the vertical video ad format, and reported that their advertisers saw up to 20% lift in install per thousand impressions (IPM). That’s great, right? – 79% of the novice vertical video consumers were in favor of the vertical video format. So, prepare to contribute to this brave new world of vertical video content. 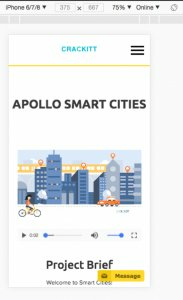 Natively uploaded videos play automatically while you need to click to play videos that have been linked with other platforms. Facebook reports imply that you can achieve as much as 1055.41% higher average share rate with native videos compared to YouTube third-party video links. So, don’t be a stranger to this native video tactic. One of the best landing pages using an explainer video as the conversion bait was that of Dropbox. They had kept their landing page simple with one engaging video and a download button. Visitors watched the video, saw the benefit of using Dropbox, and proceeded to download it. It was a simple funnel, and the conversion rate was high. Reports say that Dropbox earned a million users and bagged a revenue of $48 million. – To begin with, ensure that your landing page video is responsive. As we shared in the beginning, you can use Wistia or Vimeo’s responsive embedded code to get this done. These video-hosting platforms offer incredible analytics to help you monitor your video performance. You will get cool insights, such as at which point your viewers are dropping off, and will be able to use these to optimize the playback accordingly. – Use a thumbnail that prompts visitors to play the video. Never put your landing page video on autoplay. That’s a no-no. – Keep your video short; 60 to 90 seconds is the best. 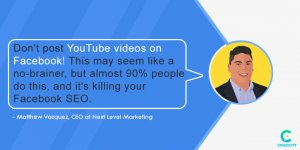 (Stats say 59% of viewers will watch your video to the end if it’s under a minute.) The idea is to ensure that your video isn’t too heavy and that it shouldn’t lag. – Position the Call to Action (CTA) button next to the video. Also, ensure that the narrator ends the video with a verbal CTA message, or use text to highlight CTA on the end screen. Try doing both as well. – Try user testing to see how your target audience interact with the video. Check if they click the video right away or if they are distracted by some other elements on your landing page. Select these probable issues before spending on PPC campaigns and ads. After that’s done, you will have a landing page with a video that can get you the ROI. Remember those “Please subscribe to our channel.” requests that video makers leave with at the end of the video? These work. If you watch a video till the end, that means you already like it. So when the creator politely asks you to subscribe, there’s a good chance you would do it. Call to actions are, therefore, important. These instruct your users on the next course of action—what they should do after watching the video. So, don’t just put up your CTA message or link in the video description. Say it. Have the narrator of the video conclude your video with the call to action message. You can also use the actor in the video to point to the CTA button at the end. (If it’s an animation video, use a hand illustration or directional cues.) You will notice that many YouTube video creators use this tactic to request the viewers to subscribe. There’s another CTA hack. 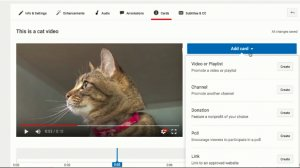 If you are using YouTube, it is its annotation and card features. You can also use these to pop up your CTA link on the screen itself. For mobile users, that makes navigation easier. Your videos should make sense even when muted. With platforms like Facebook and Twitter having the muted autoplay feature, you are bound to have viewers who will look at your video for a few seconds to determine if it’s worth watching. This means that you can’t afford to have videos that rely only on audio and narration. Your video should make sense even without the audio or at least provide a context of what’s being presented. Mute your video and see if the idea is being conveyed even without the audio, or if the visual is powerful enough to make the viewers turn the volume up or put on their earphones (if they are at a public place). Best way—try adding captions or subtitles or use typography animation. Either will help you grab viewer attention, engage them even with a muted video, and get a reaction. Making your video play on mobile devices is not your end goal. As a marketer and business owner, what matters more is conversion. By using the above optimization hacks, you can get your videos to perform better on mobile. Just remember the distinct phases of your buyer’s journey. A video designed for customers in the awareness phase may not be appealing to your audience in the evaluation phase or those hesitating at that purchase point. So, create several types of videos to power your customer’s decision journey. Conduct a survey acquiring information about your demographics if you want to be painfully precise; but for the most part, develop your content such that it is not inhibited by a small screen. Your videos should have details clearly presented so that these may not get missed out if viewed on a small screen. This is just the tip of the iceberg. If you have some cool video optimization tips, please share your story in the comments below. Vaibhav Kakkar is the CEO of Digital Web Solutions, a globally trusted agency with a full suite of digital marketing & development solutions. Vaibhav believes in building system over services, and has invested in multiple tech startups including RankWatch, NotifyFox and a CRM software to help scale up client agencies from scratch to niche-leaders with million dollar turnovers. This post provides clear idea in favor of the new viewers of blogging, that really how to do blogging. After going over a few of the blog articles on your site, I truly like your way of blogging. Having your videos make sense without sounds is a great tip. I also liked the mention of tailoring your videos to each buying phase.